Mandar Solutions | Why radio modems? The keystone in Mandar Solutions products and development is our Fleck Radio Modem. Radio modems encode, transmit, receive and decode serial data using radio waves. In general they will connect to a serial port on a device such as data loggers and acquisition systems, and send signals to, and receive signals from other radio modems. Although communication is carried out wirelessly, their uses may be limited by uneven terrain or inadequate antenna heights.. This is mitigated with the Fleck Radio by utilising Wireless Mesh Networking capabilities. Radio modems transmit serial data as radio waves at a specific frequency according to a defined radio technique. This digital data is encoded prior to transmission, and then decoded prior to receipt. Once decoded, the serial data is provided to the connected device. 434, 869 and 915MHz are license exempt frequency bands for worldwide use. The Fleck Radio is available for the 434, 869 and 915MHz license exempt frequency bands. To reduce the effect of localized frequency interference and noise, these modems may use one of two spread spectrum techniques. Both methods use more bandwidth than the system requires. Direct sequence spreads the signal on a larger band by multiplexing it with a code or signature, a fast-repetitive pattern. In the receiving radio modem, the original signal is recovered by receiving the whole spread channel and demodulating it with the same code. Direct sequence modems generally require faster circuits and a digital signal processor (DSP). Frequency hopping moves the signal through a set of narrow channels in sequence. The transmission frequency band is divided into a certain number of channels. Following a predetermined cyclic hopping pattern, the system periodically moves to a new channel. 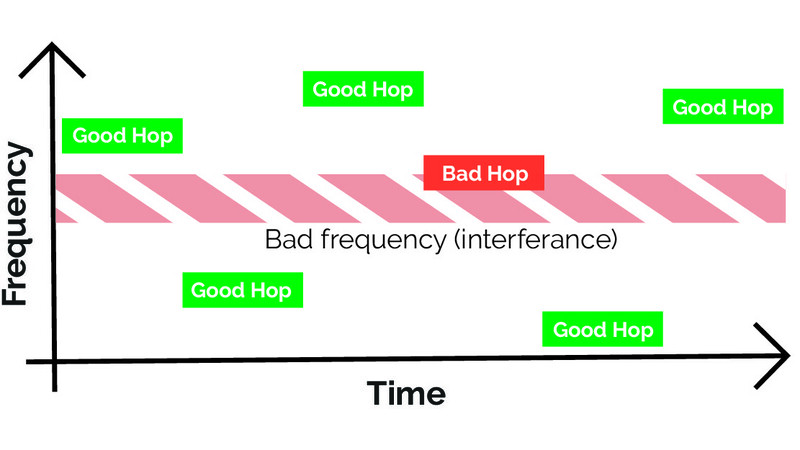 Frequency hopping avoids interference and noise by never staying in the channel for a long period of time. This is the method that the Fleck radio can use, and is used in the 915MHz frequency band. There are a few different operating modes that radio modems can use. Point-to-point devices can transmit to only one radio modem. at a time. Point-to-multipoint devices can transmit to multiple radio modems at a time. Repeater mode devices are designed to receive a radio signal and then retransmit it, perhaps on a different frequency, or with a higher power level. Mesh network devices connect directly, dynamically, and non-hierarchically, passing the messages in the best way thorough the network. Mandar Solutions Fleck Radio Tiles low power consumption provides a product that can last up to 5 years on two AA batteries. Furthermore, it utilises a TCXO for good frequency accuracy for low data rates, and a SAW filter for Category 1 receiver performance to reject unwanted signals. It boasts an ARM processor with FIPS certified encryption, and real-time clock for accurate timing, with 100mW RF output power.